We searched MEDLINE and EMBASE for peer-reviewed articles reporting on the association between physical activity and Alzheimer’s disease (AD) incidence in cohort or nested case-control studies. 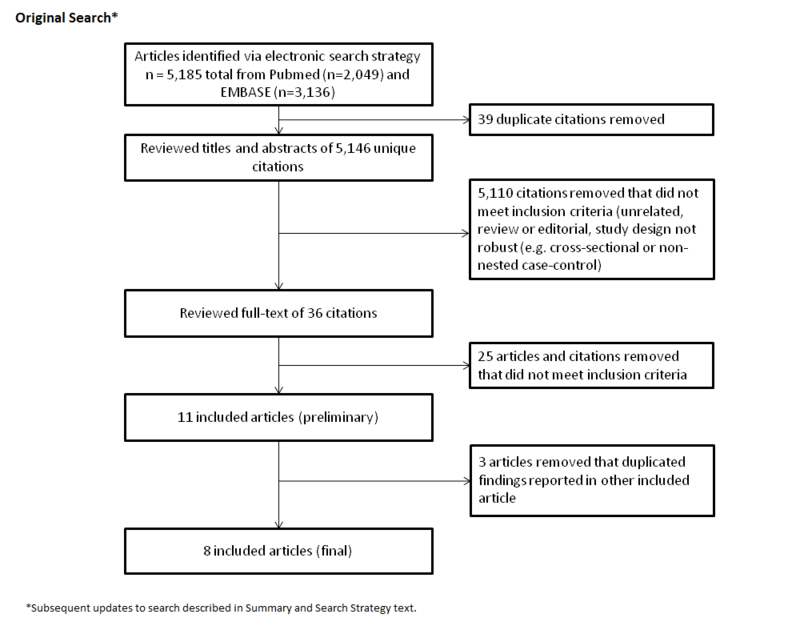 The search returned 1548 unique citations that, after title and abstract review against our inclusion criteria, were narrowed down to 66 citations for full-text review. Four non-English articles were set aside for screening and subsequent review of any meeting our inclusion criteria. Of the remaining English articles, 14 fully met criteria for inclusion in our summary tables. We excluded 4 additional articles that otherwise met our inclusion criteria, but duplicated analyses from cohorts that contributed data to other included articles. We reviewed such duplications on a case-by-case basis, and selected the most informative article(s) based on sample size, follow-up time, exposure assessment or modeling, and appropriateness of analytic methods. In addition, we found one more article that met our inclusion criteria through previous literature searches related to other risk factors. 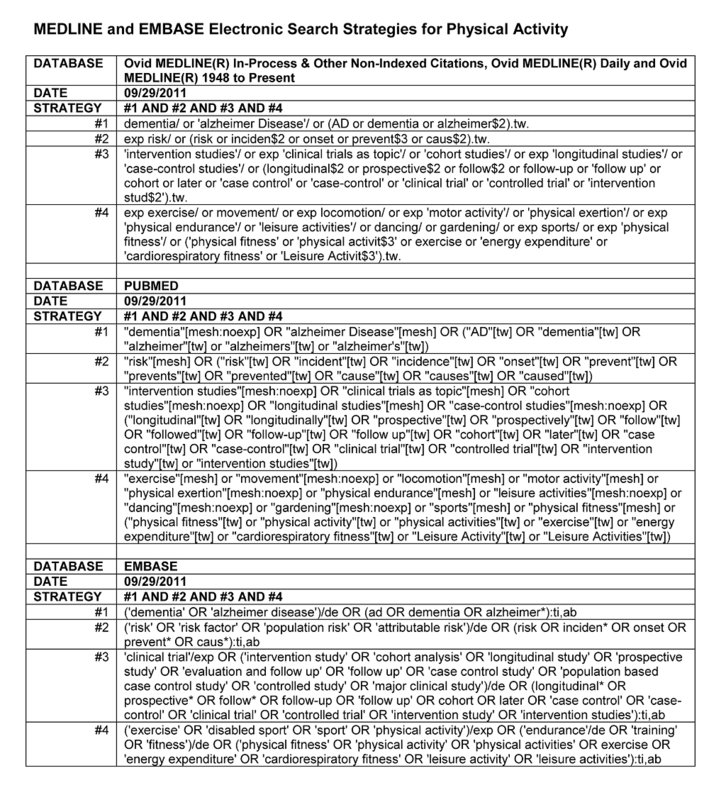 Please see our methods section for more detail on our general systematic review methods. We ran an update of the search in Pubmed and EMBASE covering articles published between November 1, 2011 and July 6, 2016, which returned 1,765 new citations. We excluded 1,745 citations that did not meet our inclusion criteria (e.g. topic not appropriate, review or editorial, animal studies). Fourteen studies were excluded after full text review because they did not meet inclusion criteria. Six articles were added to our Alzrisk tables from this updated search. Using our systematic review methods, we developed similar search strategies (table below) for Pubmed, Ovid MEDLINE and EMBASE. We searched both Ovid MEDLINE and Pubmed to compare their capabilities. For this review, we found that Pubmed was sufficient for searching MEDLINE. Some cohort studies produced multiple articles reporting on the association between physical activity and risk for Alzheimer’s disease. To avoid presenting duplicate results, we reviewed such articles on a case-by-case basis and selected the most informative article(s) based on sample size, follow-up time, exposure assessment or modeling, and appropriateness of analytic methods. We selected Laurin 2001 because Middleton 2007 reported on a small subsample of the same cohort. We included Gatz 2006 and Andel 2008 but excluded Crowe 2003. Crowe’s measure of leisure activities was a mixture of physical and non-physical activities. The Andel and Crowe papers were both included because they categorized physical activity differently in their analyses; physical activity was represented by 4 categories in Andel 2008, and by 2 categories in Gatz 2006. We included Yoshitake 1995 and excluded Fujishima 2002. We excluded the Fujishima paper because it shared the same sample, analysis and results as the Yoshitake paper. We included Abbott 2004 and excluded Taaffe 2008. The relationship between AD onset and physical activity was studied in both the Abbott paper, which analyzed distance walked per day, and the Taaffe paper, which analyzed usual 24-hour physical activity within subgroups defined by physical function score at baseline. While the research question proposed by Taaffe et al. is important, the unclear temporal ordering between physical activity and physical function make it difficult to draw clear interpretations from the results.